I’ve been talking about perfecting made-from-scratch aioli (a fancy type of mayonnaise) for a few years now, but I think I’ve finally gotten it down. It takes only a few ingredients, but quite a lot of bicep power if you are going to be legitimate and just use a whisk. Once you start mixing the ingredients, you’re pretty much a slave to the bowl until everything emulsifies and thickens- I’ll admit I usually have to finish it off with a blender. One of the best parts about aioli is that it is an excellent accompaniment to roasted vegetables, which are a staple at this time of year and an easy side dish for any holiday meal/dinner party. 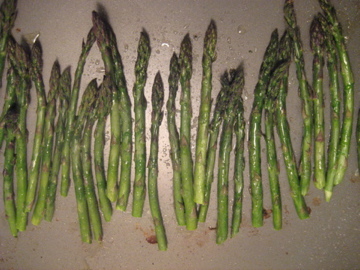 One of my favorites to roast is asparagus, especially if you can get small, sweet stalks. To prep them, hold each stalk by both ends and bend- the stalk will snap where the inedible part ends. Keep the part with the spear head, discard the wooden stem. If the stalk doesn’t snap, you probably don’t want to eat it. 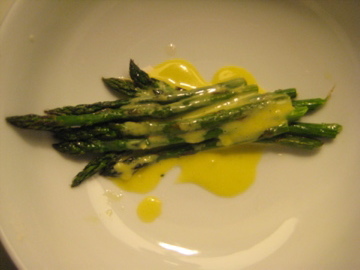 Below, my recipe for Roasted Asparagus with Lemon Garlic Aioli. 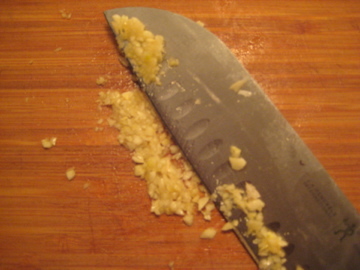 Crush the garlic cloves with your knife and cover with salt. Mince this mixture and then press your knife over and across it, making the garlic and salt into a paste. Alternately, you can use a microplane to grate the garlic, then mix with the salt. 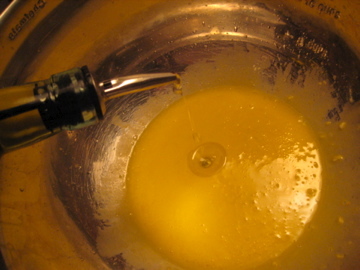 Put eggs, lemon juice, and garlic mixture in a bowl, whisk until incorporated. Then slowly stream in olive oil, whisking continuously. When your arm gets too tired to continue, break out the beater and continue until mixture thickens. If you end up needing to thin the mixture to pour/drizzle over vegetables, use lemon juice or warm water, added by the tsp until you reach the consistency you want. Prepare asparagus as mentioned above. Place on baking sheet, drizzle with olive oil and sea salt. Bake at 350 for 10-12 minutes (depending on how thick your asparagus is).